Is depression and sadness standing in the way of enjoying the quality of life you deserve? If so, put an end to feeling depressed, sad, and down all the time, and become happy, comfortable, and in full control in all situations! Hypnosis has become recognized as a potentially effective treatment for many individuals with depression. Some recent studies have shown that it is more effective than cognitive-behavioral therapy, which is the most common therapy approach in treating clinical depression. It can help you if depression is seriously affecting your life and other types of treatment have not been helpful. Hypnosis for depression can help people achieve a happier mood and decrease or dispel the pessimistic and negative thoughts that generally accompany depression. Hypnotherapy for depression uses a combination of suggestion and imagery to bring about positive changes in the unconscious processes of the depressed individual. People who undergo hypnosis for this disorder will often experience a new sense of freedom and a greater sense of control over their thoughts, their mood, and their life in general. 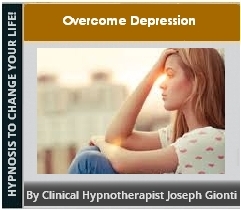 Take back control of your life and stop depression with the help of our powerful hypnosis program today!